During the 2016 presidential campaign, candidate Trump promised to repeal Obamacare at least 68 times. Last week, President Trump delivered a one-two punch at the unpopular and ineffective law. President Donald Trump’s order is not exactly a “repeal and replace” of Obamacare. 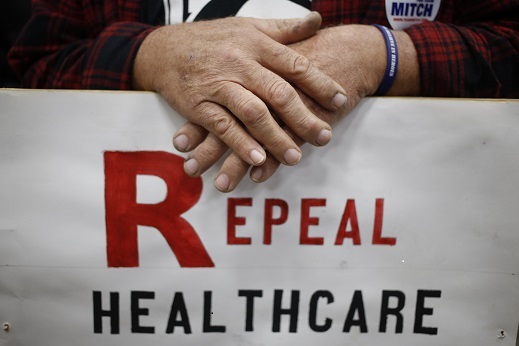 But the measure, together with a change in subsidy payments, is expected to accelerate Obamacare’s demise and put pressure on Congress to find a permanent fix. Trump signed an executive order on Oct. 12, expanding access to association health plans for small businesses and citizen associations. Additionally, the plans can be purchased across the state lines. The order is expected to revitalize the individual health insurance markets, offering more choices to consumers and bringing down premiums. President Trump’s executive actions could trigger a chain reaction in the health insurance market that spells doom for Obamacare. The law was poorly designed, negotiated in bad faith, and abysmally implemented. It has failed in almost every respect, even by government standards. Obamacare has cost much more than advertised. Before it passed, the Congressional Budget Office (CBO) projected Obamacare would cost $938 billion over ten years. But in 2016, the number was revised up to $1.938 trillion from 2017-2026, a 107 percent increase. It looks as if someone at CBO intentionally removed the “1” before the decimal in the 2010 report. The Obamacare exchanges attracted far fewer enrollees than projected. CBO estimated in 2017 there would be 23 million people insured through the Obamacare exchanges. In 2017, however, only 9.2 million Americans signed up on federal exchanges, 40 percent of CBO’s 2010 projection. If a weather forecasting company constantly misses the mark by 40-100 percent in its daily temperature forecast, it would not be in business for long. It is beyond me why CBO is still in existence. Huge annual premium increases were commonplace for Obamacare enrollees since the rollout of the Obamacare exchanges in 2013. A 2016 report by the Department of Health and Human Services (HHS) indicated the average annual cost of an unsubsidized premium for an individual healthcare plan was $2,784 before Obamacare in 2013. By 2017, the average annual cost for a similar plan on HealthCare.gov was $5,712, an increase of 105 percent. Data from online health insurance company ehealthinsurance.com are consistent with HHS’s findings. According to ehealthinsurance, the average premiums of unsubsidized individual Obamacare health insurance plans have almost doubled (an increase of 99 percent) since 2013; Over the same time period, family premiums have increased 140 percent. One of the goals of Obamacare was to reduce the number of uninsured in the United States. The portion of uninsured Americans indeed dropped to 8.6 percent in March 2017 from 18.4 percent in 2013, mainly due to Medicaid expansion. But the cost of providing Medicaid to a larger population has been disrupting the whole health insurance market. Over 5 million people lost their insurance and doctors. The unsubsidized Obamacare individual plans—roughly 2.1 million in 2017—feature prohibitively expensive premiums, sky-high deductibles, and meager benefits. The employer-sponsored health insurance market was hit as well. According to the Kaiser Family Foundation’s annual employer health benefits survey, the number of Americans insured through employment decreased from 157 million in 2013 to 151 million in 2017, presumably because businesses chose to drop or reduce health insurance benefits for their employees. Meanwhile, employer-sponsored health insurance premiums for family coverage have increased 19 percent since 2012. While millions of Americans have suffered the fallout of Obamacare, the health insurance industry has thrived during the era of Obamacare. The insurance companies have learned to cut their Obamacare losses, while taking advantage of a growing population of younger, healthier retirees. Insurance companies’ profitability in Medicare soared 279 percent in 2016. Profit from Medicare more than offsets their losses in the Obamacare exchanges; it has become the new growth engine for the insurance companies. “The general trend is growing the portion of health care claims that are directly or indirectly paid by the federal government,” Deep Banerjee, a director at S&P Global Ratings, told CNBC. No wonder one of the nicknames of Obamacare is “the Health Insurance Profit Protection and Enhancement Act”. President Trump’s executive order is not likely to have an immediate impact on health insurance premiums and medical cost. In a few years, however, the new measure could totally reshape the landscape of the individual health insurance market. In the long run, permanent healthcare reform is needed. The American people handed the control of the House, Senate, and White House to the Republicans in the 2016 election. 10 months in, Congress has failed to deliver any major reform. The Republicans need to make good on their promises to repeal and replace Obamacare. The 2018 midterm election is only a year away. Trump’s election success demonstrated how powerful the voters’ wrath can be.